This year the Winter Debates lasted for fifteen days and encompassed a wonderful variety of ways to train the mind and deepen understanding. In addition to daily meditation, there were traditional debates on the philosophical positions of the Vaibhashika and Sautrantika Schools as well as the yearly debates on Collected Topics, Types of Evidence, and Types of Minds. Papers were presented on Gampopa’s Ornament of Precious Liberation covering the second chapter on the spiritual friend up to the eighth chapter on refuge, and western-style discussions on two topics: 1) Can blind faith be considered faith? and 2) Are the Dharma and the secular world opposed or not? Starting at 8 p.m. on March 9, the final debate went into late hours and began with the topic of what it means to be contaminated or not. Since there was no competition between the shedras this year, the two teams on either side of the debate were taken from different shedras. Despite their various teachers and training, the monks quickly developed their responses and moved as one body, clapping their hands to drive their points home. The debate was enlivened further when two of the khenpos joined in from their tables on the sidelines. While explaining the commentaries, we should look at those from India and those from our lineage holders. As a basis for study, we should use those texts that accord with (1) an overview, (2) with what has been clearly resolved through reasonings, and (3) with important commentaries. The texts we study should be composed by authentic lamas from our own tradition and accord with its philosophical positions. The Karmapa commented that this concise presentation of how to study was excellent. In brief, he said, it means that the analysis and overall discussion of philosophy should be based on texts written by lineage holders, mainly focusing on the previous Karmapas. In the Gelukpa tradition, for example, the focus is on texts by Je Tsongkapa and his disciples as well as synopses of these texts written by scholars in the Gelukpa tradition. For the Kagyu followers, it fair to say that only the Kamtsang Kagyu and the Drukpa Kagyu have commentaries on all five main philosophical texts, which are major Indian works on Prajna Paramita, the Middle Way, Validity, Dharmakirti’s Commentary on Validity, Vinaya, and the Abhidharma. In the Kamtsang, these commentaries are more complete and extensive—thorough and well-edited commentaries that provide an excellent basis to uphold and propagate the tradition. 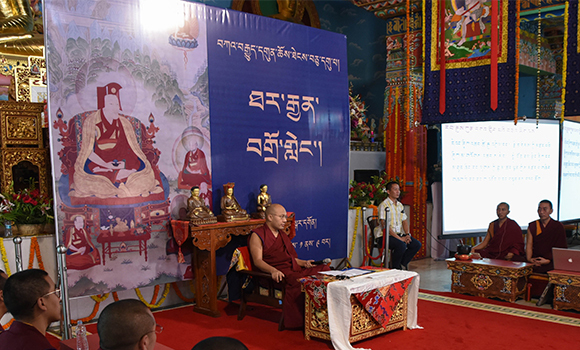 To decide the actual way and course of study, the Karmapa met with the professors, teachers, teaching assistants, and discipline masters present during the Gunchö to discuss the curriculum. Focusing on the nuns’ shedras, they decided the path of study for both nuns and monks. Many circumstances have brought about this new chapter in the history of the Karma Kamtsang: the discovery and publishing of the 8th Karmapa’s texts; the surfacing of Manjushri’s Laughter: An Overview of Validity, and the 9th Karmapa’s book on the Kamtsang shedra studies; and especially the present Karmapa’s courageous and unwavering commitment to reviving the brilliant tradition of study and practice in his Kamtsang lineage. With this renewed curriculum, the Kagyu shedras are on their way to restoring their past glory when the shedras were flourishing during time of the 7th, 8th, and 9th Karmapas, all of whom were great scholars and authors as well as realized masters. Following the remarkable announcement about the curriculum, Karmapa laid out the schedule for the Dharma activities in Bodh Gaya for next year, including the monks’ Gunchö, the Kagyu Monlam Chenmo, Tibetan New Year (Losar), and the nuns’ Arya Kshema Winter Gathering. In a surprise turn, the Karmapa appointed khenpos, who are usually focused on the studies in the shedras, to fill the positions in the shrine hall of Chant Master, Shrine Master, and Discipline Master. 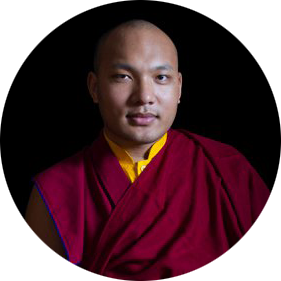 The Karmapa said he was encouraging them to be proficient both in study and practice. Attention then focused on evaluating this year’s programs. It was noted that the monks who presented papers were well prepared from their work at Gyuto, where not only did they ask many subtle questions to deepen their understanding, but also learned how to do research at an international level. They compared various editions of the text and noted the differences, found the sources for the quotations in the text, and looked for other sources to support or refute Gampopa’s statements in the Ornament of Precious Liberation. On a personal level, the monks said that they felt tremendous gratitude to His Holiness for providing this opportunity to delve into a text at such a deep level, and they hope to be able to do so at their monasteries in the future. Another participant mentioned that the real way the teachings will stay relevant and last is through these kinds of exchanges and research. A younger monk said that he had thought the Kagyu tradition was focused on meditation and had not been aware that there were such scholarly treasures in the lineage. One Khenpo noted that the Western-style discussions helped to clarify a more general picture of the text—its landscape came into view—while the debates helped to clarify specific points and develop certainty as well as a readiness to respond to questions. Sharing meals, tents, and talk, the monks from different monasteries all said they had the sense of becoming a family. The Karmapa nurtured these connections by coming to the discussions and participating himself in very lively exchanges. One memorable event was when he left his chair to stand among the monks and engage in a heated debate for over forty minutes on whether buddha nature could be considered permanent or not. The Nineteenth Winter Debates were brought to a close with the Karmapa individually thanking the numerous people from the cook to the khenpos whose hard work had made these fifteen days possible. Prayers for auspiciousness sent the benefits and the blessings of this special time out into the entire world.